Carlos Saliente is the exclusive SolBlo distributor throughout Andalucia. We can supply and install SolBlo solar vents, or supply only for DIY install, or offer trade supply. Click image to enlarge poster. SolBlo is an air flow system provided by fan, powered by electricity supplied from a solar panel. 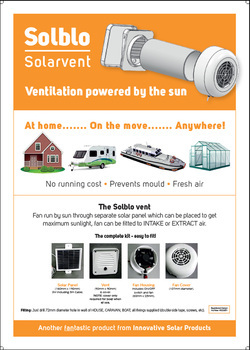 A SolBlo solarvent can be used at home, in your caravan or boat, or in your greenhouse. Air flow can be changed from IN to OUT by removing the fan and turning it through 180 degrees. What does the kit comprise? 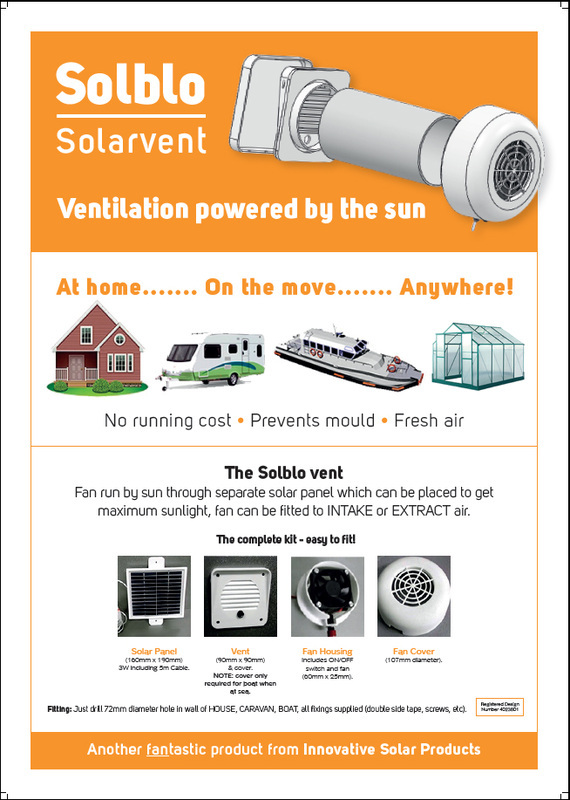 The SolBlo kit comprises a solar panel, vent, fan housing and fan cover. How do you fit a SolBlo solarvent? Just drill a 72mm diameter hole in the wall of your house, caravan or boat. All fixings are supplied. After installation, SolarVenti runs automatically and completely without cost. It doesn’t just remove moisture; SolarVenti pushes fresh air into a building and the risk of dry rot is decreased. Also SolarVenti operates without an electrical power supply, so no extra heating is needed to keep the house dry. It also removes odours. Carlos Saliente is the exclusive SolBlo distributor for Andalucia.